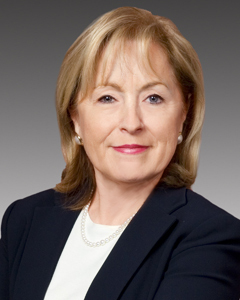 Recently, the Ontario Heritage Trust interviewed Madeleine Meilleur – Ontario’s Minister of Community Safety and Correctional Services, and the Minister Responsible for Francophone Affairs. Her remarkable story is firmly rooted in her French-Canadian heritage. We spoke of challenges and opportunities. She is clearly confident that Ontario’s francophone identity is changing, evolving and adapting, but more than ever it continues to define the future of our society. Ontario Heritage Trust: Could you talk a little bit about your family history and explain how your family came to live in Ontario. Madeleine Meilleur: Actually, my family comes from a little town in Quebec, called Kiamika, in the Upper Laurentians. I grew up there with my parents, one brother and five sisters, and I go back often to visit my family. My father spoke only French, but thought more doors would open for his children if they learned English as well. So, he encouraged us from a very young age to open up our horizons – especially to learn English. I wanted to work in health care, and knowing I could study nursing at Montfort Hospital, I left Quebec at the age of 17 to go into that program. The experience of studying and working at Montfort – the hospital that became such a powerful symbol for the Franco-Ontarian community – left a lasting impression on me. Even though my family is from Quebec – and those roots are important to me – I think of myself as a fully-fledged Franco-Ontarian. For me, Ontario is not only where I live, it’s where I studied, where I have had my career, and where I have the privilege of being elected to represent my fellow citizens. You will understand that, for me, Ontario – and in particular French-speaking Ontario – is my whole life. OHT: To what extent was your choice of career influenced by your heritage? And what has it been like, being a francophone in cabinet? MM: It’s often said that if you know where you come from you’ll know where you’re going, and this saying is true of me. My father instilled into us from a very young age that there were some things in life that were worth fighting for, and to fight hard when necessary. I will always remember the times my father used to take me to the political meetings he would help organize. I was excited to be there, but I couldn’t help noticing that there were hardly any women. I never thought that one day I would be a part of all that. While I have very fond memories of the time I was studying to be a nurse, my career path changed. I went on to study law at the University of Ottawa, and then went into municipal politics. I may be the only francophone in cabinet, but there are a lot of francophiles! Many of the ministers are fully bilingual, including Premier Dalton McGuinty. I have the good fortune to work with colleagues who respect, admire and try to do everything possible to promote our francophone communities. The Office of Francophone Affairs portfolio is complex because it cuts across all the other ministries. And so knowing that I can count on my colleagues in our efforts to support, defend and strengthen francophone rights is a definite and necessary advantage. OHT: What are some of the challenges that the francophone community in Ontario still faces? What are some of the opportunities that could come out of these challenges? MM: There is no doubt that the main challenge for the Franco-Ontarian community is linguistic assimilation. Although Ontario’s is the second-largest francophone community after Quebec, and accounts for more than half of all Canadians with a French background who live outside Quebec, there is no getting around the fact that, in North America, the Franco-Ontarian community is swimming in an anglophone ocean. What’s more, the attraction of American culture is a constant reality and remains, even for English Canada, an enormous challenge if we want to hold back the phenomenon of cultural assimilation. That said, the French language continues to be very much alive in the province, in the country and internationally. There are many opportunities in French in many sectors, including business. It’s a matter of seizing those opportunities. From a government point of view, I think we have made tremendous progress in the past few years with regard to meeting the objectives of the French Language Services Act. In my opinion, Ontario is better equipped today to meet the needs of francophones in the key sectors of education, health, law, social services, culture and politics. OHT: The Office of Francophone Affairs website describes a francophone community that is vibrant and diverse. How has its increasingly diverse nature contributed to the evolution of the Franco-Ontarian identity? MM: The face of the community has changed a great deal in the past 10 to 20 years, and this diversification has made it possible not only to enrich the life of the Franco-Ontarian community, but also to contribute to its evolving identity. Take the case of Toronto. From 2001 to 2006, more than 5,000 francophone immigrants settled there. Moreover, according to the 2006 census, visible minorities make up a third of the francophone population of Toronto. Recognizing this new dynamic and this new reality, in June 2009 the government adopted an inclusive definition of “francophone” that better reflects the diversity of this changing community in Ontario. This new definition has been very well received by newcomers whose mother tongue is not French but who speak French at home. This francophone capability we have is an extraordinary resource for the province that creates opportunities for all kinds of exchanges with the rest of the world. OHT: For the coming years, what role do you see the provincial government playing in promoting Franco-Ontarian identity and culture, and in supporting francophone communities across Ontario? MM: One of the key projects that will promote Franco-Ontarian identity and culture and support our Franco-Ontarian communities is the commemoration of 400 years of French presence in Ontario. The government recognizes the contribution of Ontario’s francophones and sees the 400th anniversary of Champlain’s travels in Ontario and the French presence here as the perfect occasion to celebrate 400 years of francophone history and culture. The province is looking at holding the official 400-year commemorations in the summer of 2015, possibly beginning during the Pan Am Games in Toronto. The goal of the celebrations in Ontario will be to involve not only francophones, but all Ontarians in the activities to mark the 400th anniversary of the French presence in Ontario. The Office is currently organizing roundtables to discuss various ideas and concepts of the form the celebrations could take in the different regions of the province. The Office of Francophone Affairs intends to work closely with the Réseau du patrimoine franco-ontarien (RPFO) heritage network, but also with many other provincial organizations. Municipalities, school boards and the regional tourism organizations will also have important roles. First Nations and the Métis Nation of Ontario will also be invited to participate in this planning. The route Samuel de Champlain followed includes rural areas like the Mattawa River, the multiple attractions of the Ottawa urban region, many historic sites around the shore of Lake Huron, and all the way down to the site of Étienne Brûlé’s portage in the west end of Toronto. There’s no doubt that there will be festivals, historical re-enactments and events on the theme of the 400th anniversary organized by the provincial government, municipalities and various organizations and businesses in Ontario. Commemorative activities related to Champlain could provide opportunities for tourism in the longer term and a chance to leave a legacy, enabling us to support our francophone communities while promoting Franco-Ontarian identity and culture. OHT: In your opinion, what role can francophone youth play in the development of Franco-Ontarian identity and community in the 21st century? MM: Our young people are our future; they are essential to developing the identity of the Franco-Ontarian community of tomorrow. That’s why it’s important for each generation to know when it’s time to let go of the reins and pass the torch to the next generation. Unfortunately, however, there is a significant risk of Franco-Ontarian youth becoming disengaged from their culture and language. This phenomenon is aggravated by the constant threat of assimilation in a minority situation. This is why the government has launched a youth strategy to encourage young Franco-Ontarians to participate in their communities and to reinforce their sense of belonging. I am thinking, for example, of the “Héros de chez nous” project with the federation of francophone seniors and retired persons (FAFO). The purpose of this project is to help bridge the gap between the generations and to foster opportunities for exchanges and person-to-person meetings in the community. I would also mention the project with the francophone Association of Municipalities of Ontario (AFMO), whose objective is to introduce young people to municipal politics. This is also why the government has launched the Aménagement Linguistique Policy for educational institutions from elementary to secondary to post-secondary. This policy focuses on the identity of young francophones and their specific needs. All these initiatives are intended to offer Franco-Ontarian youth more opportunities to fulfil their potential in French in Ontario. OHT: To what extent has the vast network of francophone institutions and associations available to French-speaking people in Ontario contributed to the development and flourishing of their identity? MM: The Franco-Ontarian community has created a large number of institutions, associations and socio-cultural organizations that have helped it to grow and flourish in the province. This network of institutions and associations is strong evidence of the deep roots that francophones have put down in Ontario’s soil. It has enabled, and continues to enable, the community to live, study, work, enjoy entertainment and obtain health care in French in Ontario. We need to recall that Franco-Ontarians have shown great courage and perseverance in not only keeping their language, culture and heritage alive, but really making it shine. As for ties to the province, there has been a marked change in the way people perceive and identify themselves, compared to the early 20th century. In those days, people never talked about Franco-Ontarians; they were French Canadians from Ontario. It wasn’t until the late 1960s and early 1970s, with all the changes that came with the Quiet Revolution in Quebec, that the term Franco-Ontarian became common. Today, I think the Franco-Ontarian community’s contribution to the province is better understood and recognized. In my opinion, this reinforces their sense of identity. OHT: On April 26, 2010, the Legislative Assembly unanimously passed the Franco-Ontarian Day Act, proclaiming September 25th of each year as Franco-Ontarian Day. What is the significance of the choice of this date? And why is it important to celebrate this day? MM: September 25 was already an important date in the history of francophones in Ontario. It’s the anniversary of the unveiling of the Franco-Ontarian flag on September 25, 1975 in Sudbury. French-language schools were already celebrating this day every year. Also, the Assemblée de la francophonie de l’Ontario had passed a resolution in 2009, asking the government to officially recognize September 25 for Ontario francophones. By proclaiming September 25 as Franco-Ontarian Day, we are marking an entirely Ontarian event. This act really recognizes the cultural, social, economic and political contribution of the Franco-Ontarian community. OHT: As you see it, how important is the francophonie for the francophone community in Ontario? MM: The francophonie enables the Franco-Ontarian community to weave close ties with people in the four corners of the earth and it reminds us that we are part of a major international community. Added to that, the diversity of the Franco-Ontarian community today is a good reflection of the diversity of the international francophonie. The urban centres of Toronto, Ottawa and Sudbury are in a unique situation of being able to bring together francophones from all over the world in one place: Canadians, Haitians, Africans, Europeans and Asians. OHT: Do you have a special message to send out to our readers? MM: Absolutely. A few messages in fact. First, a message of pride in our shared heritage and this language that, generation after generation, continues to connect us to one another. A message of mobilization next, for everyone at their own level to keep living their daily lives in French in Ontario. And, finally, a message of confidence that our francophone identity is changing, evolving, adapting, but more than ever it continues to define the future of our society.